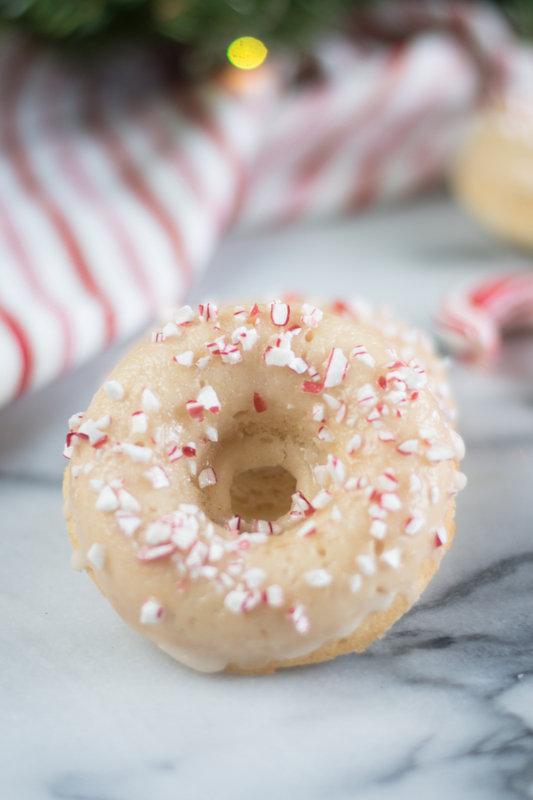 Candy Cane Donuts are the perfect Christmas breakfast treat! Ever since purchasing a donut pan a few years ago, I can’t stop baking up vegan donuts. 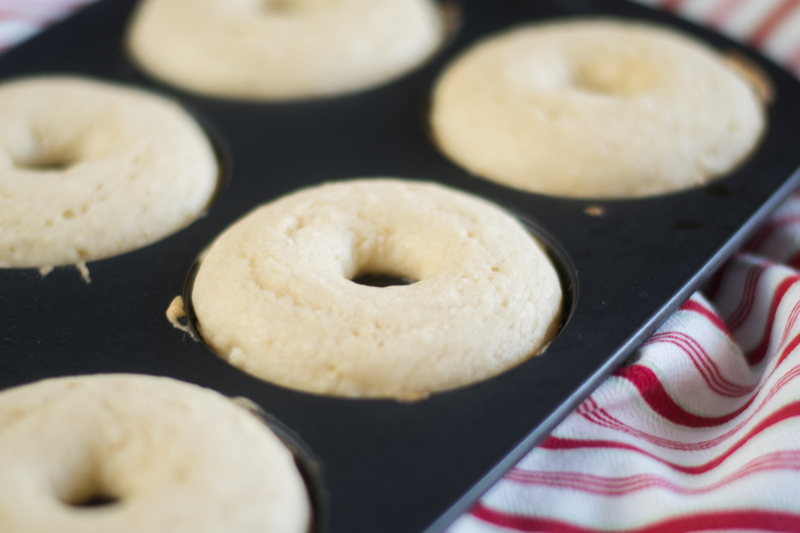 A donut pan might not seem like a kitchen staple, but it’s well worth purchasing. I use my donut pan all the time. It is so easy to make a batch homemade baked donuts! It is the best $10 that I’ve spent! 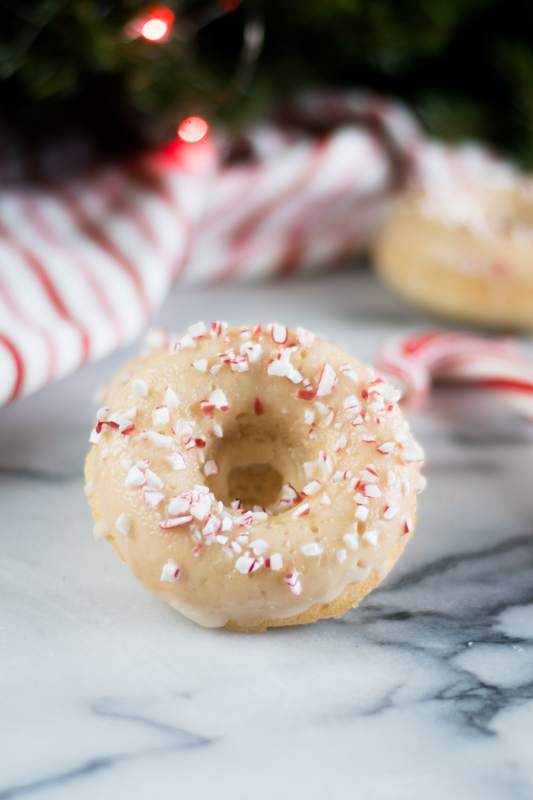 This month I’ve been busy in the kitchen baking up festive bake goods like these Candy Cane Donuts. I have been on a huge baking kick lately. I’m not sure if it’s the holiday season, but I just can’t help baking holiday treats! 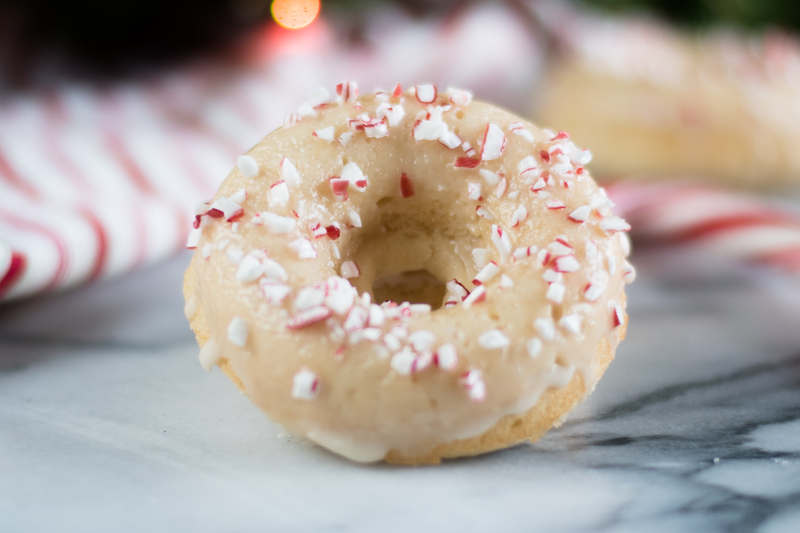 These Candy Cane Donuts are so easy to make. The batter is really simple to whip up. For my baked donuts, I really love using aquafaba for the egg. It creates a light and fluffy donut. For an extra hint of peppermint, I add peppermint extract to the batter. 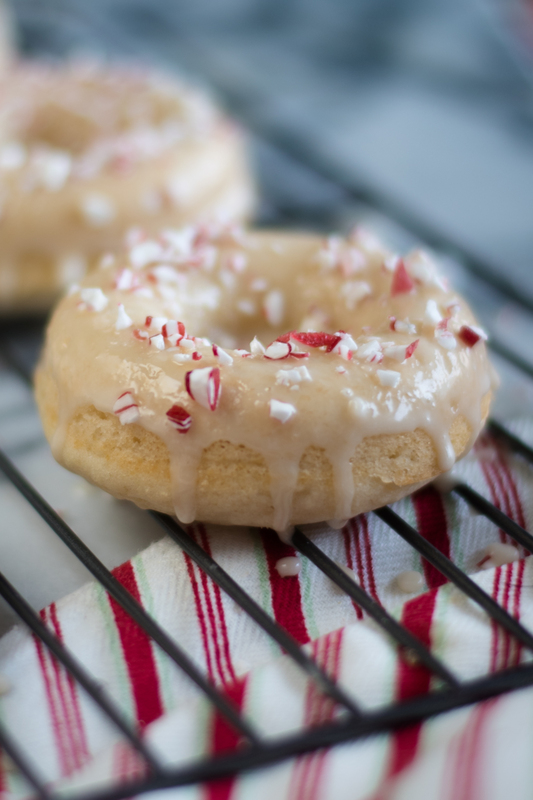 These donuts aren’t overly pepperminty. Just the right balance. 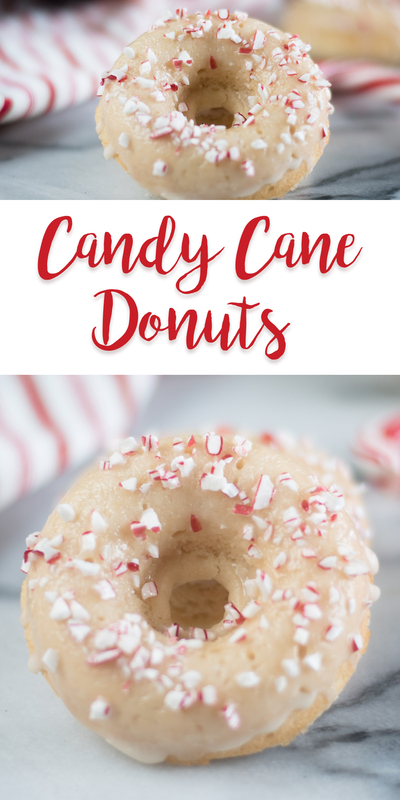 After the donuts have baked and cooled, the get dipped in a simple glaze and the topped with crushed candy canes. 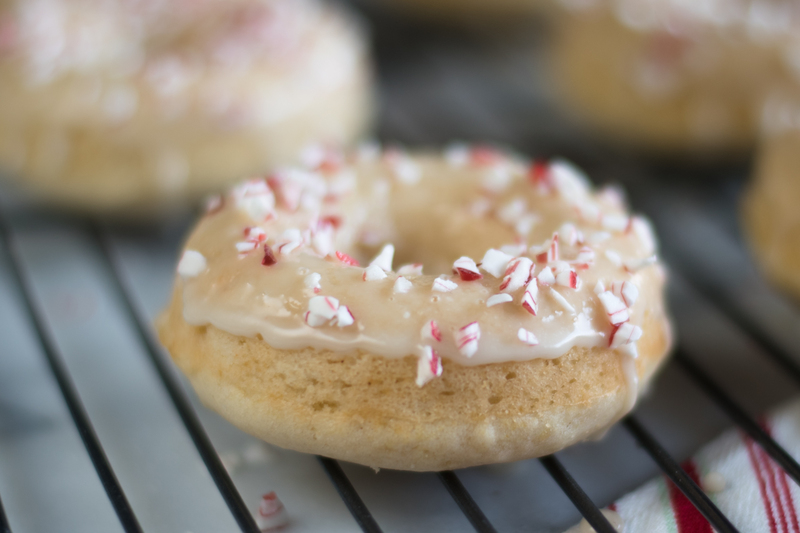 These Candy Cane Donuts would make for a very festive breakfast. Perfect for Christmas morning! In a mixing bowl, cream together the softened vegan butter and sugar. Add the aquafaba and whisk until mixed into the butter and sugar mixture. Add the peppermint extract and almond milk. Mix until evenly combined. Bake for 10-12 minutes, or until a tester comes out clean. In a shallow bowl, add the powdered sugar and almond milk. Whisk until you have a smooth glaze. If the glaze is too thick add more milk and if it is too liquidly add more powdered sugar. Dip the donut tops in the glaze. Garnish with crushed candy canes.